Simplicity is key to many things, and our Cold Laser Protocols software is no different. I understand that being a doctor is an extremely time consuming occupation. I get it, I’ve been doing it for over 18 years. Every bit of time I can get back in my day, I am all for. This is exactly the reason our Cold Laser Protocols software has been designed to be simple and easy to use. Think of the software you may already be using in your practice, Microsoft’s Office suite, patient management software, and so on. It’s all complex, it all takes time to learn, and often you just don’t have the time to figure it all out, so you end up paying a fortune for it and just skim the surface. With our Cold Laser Protocols software, we believe simplicity is key. It really doesn’t take much learning at all to figure out. Once you have set your own account up in it, adding patients to it is easy. Their details are added in, and then the software will prompt you to ask a series of questions. Based on the answers, the software will then calculate the optimum treatment plan for that patient. Simply follow the on screen directions, apply the treatment to your patient, and that’s it. Simple. But our protocols software doesn’t end there because we will be collating all the data from all the docs using this system worldwide and creating a database of what has worked and then creating updates based on this information. 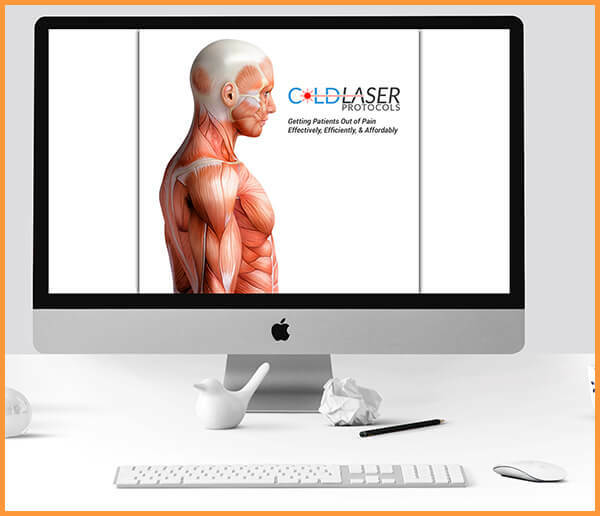 These future updates will be included free with our membership program, so all our docs can be sure that not only do they have access to proven cold laser protocols, but they also have access to the latest version containing all the refinements and improvements as time goes by. And once again, it will still be easy to use. So if you haven’t already, sign up below, get your name on the list as we will be opening our doors soon, and we will only make these protocols available to one doctor per geographic location, providing exclusive access for that doc.